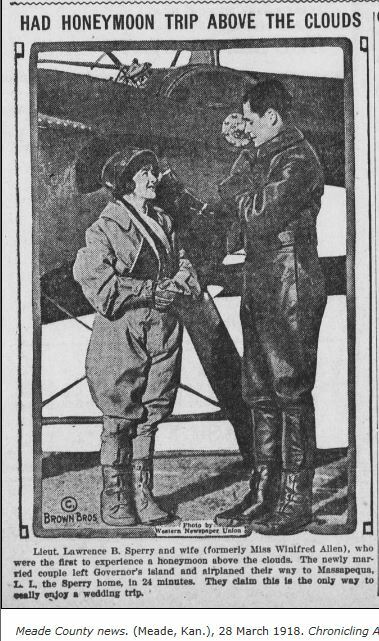 Lieutenant Lawrence B. Sperry, 23, and his fiancée, movie actress Winifred Allen, 20, climbed into the cockpit of a U.S. Navy biplane in Massapequa, Long Island, on the afternoon of February 18, 1917, and headed west. The couple landed thirty miles later on Governors Island. Lieutenant Sperry, a skilled aviator, then taxied the airplane directly to the door of St. Cornelius the Centurion Chapel for their wedding. Friends and family, officers from Fort Jay, and naval aviators welcomed the daring couple. So was Chaplain A.B. Smith, the army post’s curate. Rev. Smith and the guests were waiting on the chapel steps to witness the couple fly in. They cheered as the couple landed and pulled up “almost to the door of the chapel,” a reporter remarked. Lieutenant Sperry was stationed in Massapequa and only had a one-day pass, due to the wartime activity. Following the service the group walked to the ferry dock for the ride to Manhattan. A “fleet of taxicabs” took everyone to the Hotel Vanderbilt, Park Avenue and Thirty-fourth Street, for the dinner and reception. It’s not recorded how many went back the next morning to watch the couple fly back to Massapequa at 6:15 a.m. so Lieutenant Sperry could get back to work on time. So did Allen. Her next picture was called The Man Hater. Allen was born in New Rochelle, New York, on June 26, 1896. 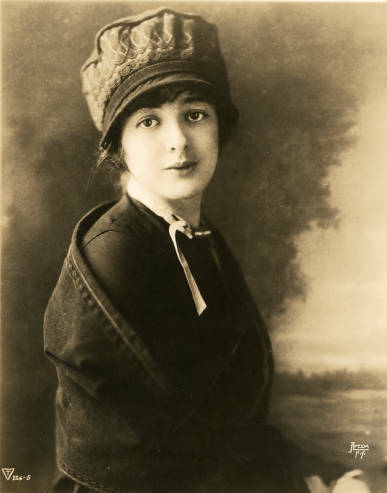 She was discovered as a teenager and made a string of silent movies for Triangle Pictures. Her break came in 1916 when she appeared opposite Jack Pickford in Seventeen. Ten months after the wedding, their son, Lawrence Jr. was born. Winifred Allen in 1919. Credit: University of Washington Libraries. Special Collections Division. Sperry was not only a pilot, he was an engineer and an inventor. His father, scientist Elmer A. Sperry, invented the first stabilizer for airplanes. The younger Sperry invented the gyroscope. Lawrence Burst Sperry was born in Chicago on Dec. 21, 1893. He grew up in Brooklyn. When he was 17 he built a glider in his house and his brothers towed him behind a car at the Sheepshead Bay Racetrack. Sperry earned pilot license #11 from the Aero Club of America. In 1911 he built his own powered airplane and flew it over Sheepshead Bay. Sperry continued his inventions and innovations. He invented the autopilot in 1912 for his father’s stabilizer, and sold the invention to Glenn Curtiss. The principles of the gyroscope stabilizer are still used more than a century later. As America was drawn into World War I, Sperry put his new company to work. In 1916 he invented a wireless radio for airplanes, which weighed “only” 16 pounds. Sperry was the first pilot to wirelessly communicate via radio with another pilot in the air. He also invented the flying boat, bomb dropper, remote control bombsight, landing lights, autopilot, and about 30 more. He also may have invented the Mile High Club. He was commissioned an ensign in the Navy and moved his operation to the test fields around Long Island. He made a daring series of pioneer military flights, such as one in 1916 from Amityville, Long Island, to Boston over rough seas overnight in the dark. He also landed at least once at Fort Jay in 1916. During the war he developed new designs for the military. Following the war his company was an innovator in the booming aviation industry, and he flew across the country to promote it. His biggest stunt was on August 22, 1922, when he landed one of the company’s new monoplanes on the steps of the U.S. Capitol to prove the safety of air transportation. In September 1923 Winifred Allen resumed her motion picture career. She was given the lead in Big Brother opposite Tom Moore, written by Rex Beach and directed by Allan Dwan. On December 31, 1923, Sperry crashed in the English Channel. His plane was found floating right side up, but Sperry drowned while trying to swim to shore. He was 30 years old. His body was recovered ten days later near Rye, Sussex. His remains are interred in Brookville Cemetery, Long Island. In December 1929 Winifred Allen Sperry remarried to Edward D. Tenney, chairman of the board of directors of Matson Navigation Company. Upon her death in 1943 she was interred next to Lawrence. Sperry’s name is included on the 1954 Early Birds Monument on King Avenue.